For years, Honda has shown off its Uni-Cub, a kind of motorized unicycle that balances itself, as a personal mobility device. At CES 2017 Honda showed how it leveraged that technology to make a self-balancing, semi autonomous motorcycle, something likely more relevant in the real world. During Honda’s press conference, a riderless Uni-Cub rolled out from backstage, followed by a motorcycle, which accomplished the same self-balancing trick while free of a rider. Fatal accidents on motorcycles occur at a rate 27 times greater than with cars, according to the Insurance Institute for Highway Safety, partially reflecting the lesser availability of safety technologies for motorcycles. Honda’s innovation could give motorcycles more stability, to keep a rider upright. Self-balancing will certainly mean the convenience of never having to put down a kickstand. As a side-benefit, Honda spokesperson Sage Marie said the motorcycle could be equipped with self-driving capability. A rider could get off the bike curbside at a restaurant, for example, then go inside while the bike finds its own parking. 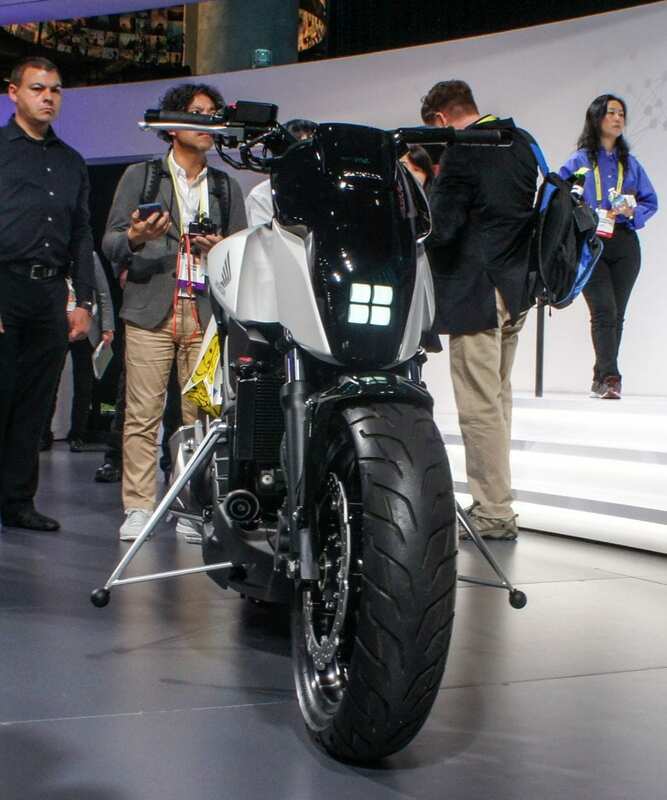 During the demo, Honda’s self-balancing motorcycle sat stationary next to a Uni-Cub, its front wheel twitching back and forth to keep it upright. Rather than gyroscopes, which Honda notes would add too much weight, the motorcycle uses Honda’s own technology to stay vertical. Two struts sticking out from the sides of the motorcycle, which did not touch the ground, make up part of this technology. Those struts would need to be refined for an actual production bike. BMW showed off its own self-balancing motorcycle concept last year, which seemed as steady as the Honda concept. Given these two examples, it would seem a production version may come in the near future.